Kimchi, also spelled gimchi or kimchee, refers to a traditional Korean fermented dish made of seasoned vegetables. The most common Korean banchan, Koreans eat kimchi eaten with rice along with other banchan dishes. Kimchi constitutes a common ingredient cooked with other ingredients to make dishes such as kimchi stew (kimchi jjigae) and kimchi fried rice (kimchi bokkeumbap). Japanese enjoy Kimchi as a popular side dish. Kimchi has been a mainstay of Korean culture for over 2,000 years. Originally created as a way of preserving vegetables that could stay fresh throughout the year in large jar containers stored outside before refrigeration, kimchi has become a comfort food for Koreans even in the age of refrigeration. Koreans living in Korean diaspora communities continue making and eating kimchi as an indispensable feature of Korean culture. Eating kimchi and speaking Korean are both considered essential for maintaining Korean culture. The health benefits of kimchi, for the most part, have been proven and recommended by nutritionists. The history of kimchi traces back to ancient times. References to kimchi exist as early as 2,600-3,000 years ago. The first Chinese poetry book, ShiKyung, provides the first text-written evidence of its existence. In that book, the poet referred to kimchi as “Ji,” the term used before "Chimchae". The earliest form of kimchi consisted only of salted vegetables. In the twelfth century people began to include other spices to create different flavors, such as sweet and sour savor, and colors of kimchi, such as white and orange. Chili peppers, now a standard ingredient in kimchi, had been unknown in Korea since the early seventeenth century. Chili peppers originated in the America, introduced to East Asia by western traders. Kimchi made with chili peppers and baechu, a variety of Chinese cabbage, gained popularity in the nineteenth century, baechu kimchi continues as the most common and popular form of kimchi today. 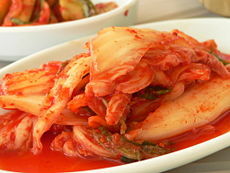 Kimchi's composition separates into the main vegetable ingredient and the mix of seasonings used to flavor the kimchi. While the napa cabbage variety ranks as the most popular type of kimchi, countless different types exist, including regional and seasonal varieties. Popular variants include kkakdugi (깍두기), a kimchi made with cubed radishes, and oh-ee so-bae-gi (오이소배기), a stuffed cucumber kimchi. Kkaennip (깻잎) kimchi features layers of perilla leaves marinated in soy sauce and other spices. The Kimchi Field Museum in Seoul has documented 187 historic and current varieties of kimchi. Although the most common seasonings include brine, garlic, scallions and chili pepper grind, the cook replaces or adds countless varieties of seasoning and ingredients depending on the type of kimchi made. Common seasonings also include ginger, onions, salted fish or shellfish as well as fruit or fresh seafood. Kimchi comes in other forms than spicy or red. White kimchi (baekkimchi), seasoned without the chili pepper grind, and white radish kimchi (dongchimi), a popular kimchi without spice. Koreans eat a popular dish of cold noodles in "donchimi" brine (dongchimi gooksu) widely during the summer months. Kimchi categorizes according to main ingredients, regions or seasons. Korea's northern and southern sections have a considerable temperature difference. Northern regions tend to have longer winters compared to the southern regions of Korea. Kimchi from the northern parts of Korea tend to have less salt as well as less red peppers and usually leave out have brined seafood for seasoning. Northern kimchi often has a watery consistency. Unlike northern styles, kimchi in the southern parts of Korea, such as Jeolla-do and Gyeongsang-do, contains salt, chili peppers and salted fish liberally. Depending upon the season of the year, the various weather conditions, and ingredients available in the region, Korean produce different varieties of kimchi. Due to its proximity to the ocean, people in this particular region use fresh fish and oysters to season their kimchi. The taste of kimchi in Hwanghaedo can be best described as "moderate"—not bland but not overly spicy. Most kimchi from this region has less color since red pepper flakes are not used. The typical kimchi for Hwanghaedo is called pumpkin kimchi (bundi). People use a wide variety of vegetables and seasonings to make kimchi. Gyeonggido kimchi is also well known for its eye-catching decorations. Instead of using fermented fish, people in the region rely on salt and fermentation to make savory kimchi. Chungcheongdo is known for the greatest varieties of kimchi. Compared to other regions, it is very typical in Gangwondo to store kimchi for longer periods of time. Unlike other coastal regions in Korea, kimchi in this area does not contain much salted fish. People use different types of fermented fish, such as salted yellow corvine and salted butterfish to create different seasonings for kimchi. This region is famous for salty and spicy flavors in its dishes and their kimchi is no exception. The most common seasoning components are salted anchovies and salt, which produce a briny and savory flavor. Dongchimi (동치미) is largely eaten during winter season. Traditionally, after a long period of consuming kimjang kimchi (winter kimchi) during the winter, Koreans enjoy making fresh potherbs and vegetables kimchi. People consume those kinds of unfermented kimchi fresh. Young summer radishes and cucumbers are popular summer vegetables made into kimchi, yeolmu kimchi, in summer are made with whole summer radishes that are eaten in several bites. Brined fish or shellfish can be added and freshly ground dried chili peppers are often used. Baechu kimchi is the most common type of kimchi in the fall. It is prepared by inserting blended stuffing materials, called sok (literally meaning inside), between layers of salted leaves of uncut, whole cabbage. The ingredients of sok can vary, depending on the different regions and weather conditions. Generally, beachukimchi tends to have a strong salty flavor because it contains a large amount of fermented fish or shellfish. Traditionally, the greatest varieties of kimchi were available during the winter. In preparation for the long winter months, many types of kimchi were prepared in early winter and stored in the ground in large earthenware kimchi pots. These days, kimchi refrigerators offering precise temperature controls are used to store winter kimchi. It is often November or December when people begin to make kimchi and women often gather together in each others' homes to help with winter kimchi preparations. White kimchi (baek kimchi), is a common and popular kimchi to make during the wintertime. "Baechu" is made with salted cabbage filled with thin strips of radish, parsley, pine nuts, pears, chestnuts, shredded red pepper, manna lichen (석이버섯), garlic, and ginger. Kimchi Jigae (Stew). A popular stew made with kimchi, it is commonly cooked with kimchi, fresh vegetables and pork or tuna although countless variations exist. Kimchi, made of various vegetables, contains a high concentration of dietary fibers, while being low in calories, providing 80 percent of the daily required amount of ascorbic acid and carotene. Most types of kimchi contain common ingredients like onions, garlic and peppers all with well-known health benefits. The vegetables being made into kimchi also contribute to the overall nutritional value. Kimchi is rich in vitamin A, thiamine (B1), riboflavin (B2), calcium and iron,  and also has active and beneficial bacterial cultures of Lactobacilli, which results in a higher lactic acid content in the final product than in yoghurt. Kimchi has a well-supported reputation as a healthy food, recommended by popular health magazines, such as the periodical Health. Health magazine named kimchi in its list of top five "World's Healthiest Foods" for abundant vitamins, aiding digestion, and even possibly retarding cancer growth. Research indicates that kimchi increases the risk of gastric cancer, most likely from nitrates and salt), while nonfermented alliums and nonfermented seafood have preventative qualities. Interestingly, research has also found kimchi possesses preventative effects against as well as a risk factor for gastric cancer. Most Koreans store kimchi in a separate refrigerator designed to keep kimchi at an optimal temperature for proper fermentation. The South Korean Korea Aerospace Research Institute (KARI) hope to have the first Korean in space to experiment with kimchi while aboard the Russian-manned space ship Soyuz. KARI has developed a space-safe kimchi recipe by sterilizing the food with radiation blasts, heat, freezing and packaging. The Kimchi Field Museum in Seoul, Korea, informs international visitors about Kimchi’s history, varieties, and value. Open to the general public, the museum provides unique insight to Koreans favorite dish. The museum collects data on kimchi related resources and statistics, offering participation in kimchi related activities, such as the kimchi-making process and kimchi tasting each month. The museum takes it mission to provide visitors with the most complete historical view of Kimchi in one place. Website: www.kimchimuseum.co.kr Kimchi Field Museum. 2005. Pulmuone Inc., one of the largest food production companies in Korea, originally established the Kimchi Field Museum in 1986 in Pil-dong, Jung-gu. In 1988, the company moved the museum to the COEX (Convention and Exhibition Center) as a venue more accessible to international tourists visiting the Summer Olympic Games held in Seoul, South Korea. In 2000, Pulmuone expanded the museum while improve its facilities for visitors to the third ASEM meeting, the Asia-Europe Meeting, in Seoul, Korea, hosting participant from 41 countries. 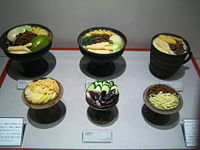 The museum divides into three sections, each section of the museum illustrating varieties of kimchi-related information. The first section of the museum relates mainly to kimchi’s history. In “The Exhibition of Ancient Books about Kimchi History,” visitors view the old books and articles related to kimchi history. In “The Models of Kimchi in Each Period” visitors inspect the trends of kimchi within the time periods of Korean history. Next, displays relate accounts of how people included hot peppers in kimchi. By studying a time table, people can easily comprehend the history of kimchi. The second section of the Kimchi Field Museum consists of displays showing the process of kimchi making, as well as movies. People view models of eighty different kinds of kimchi, listing the ingredients included in kimchi with accompanying pictures. The displays offer information about what kind of spices people have used before they adopted red peppers from Japan and Korea. 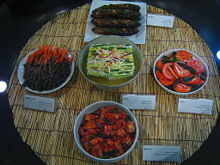 A display illustrates the kinds of kimchi by geographic district. 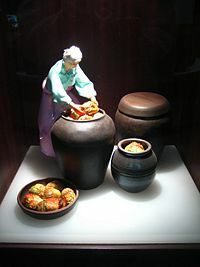 The museum provides detailed explanations of the process of making kimchi with a diorama for each step. One display shows the typical environment (background) for kimchi making day. Pictures of the variety of kimchi comprise a major area of the second section of the museum. Visitors may take pictures of kimchi in two designated areas. A major display shows the nutritional benefits of kimchi, compared to other kinds of fermented vegetables in the world. Microscopes enable visitors to observe the lactobacillus in Kimchi responsible for fermentation. An oversized world map pinpoints locations around the world that import kimchi. A tasting room gives people an opportunity to taste two kinds of kimchi each month. The final section of the museum displays old and recent books about not only kimchi, but also about the traditional foods of Korea. The room also offers kimchi-related articles and movies. ↑ Misuzu Nakamura (May 2001)"The Japan Korea Kimchi Dispute." Retrieved November 30, 2007. ↑ Kimchi Museum Official WebsiteRetrieved November 30, 2007. ↑ Tour2Korea Introduction to Korean Food: Kimchi History.Retrieved November 30, 2007. ↑ "yahookorea"Retrieved November 30, 2007. ↑  "Kimchi in Korea: By Season." Korea Agro-Fisheries Trade Corp.Retrieved November 30, 2007. ↑ Christina Bae. "Kimchi? Korean Fermented Food." (University of Bristol)Retrieved November 30, 2007. ↑ Nan et al., "Kimchi and soybean pastes are risk factors of gastric cancer." [http://www.wjgnet.com/100-9327/11/3175.pdf>Retrieved November 30, 2007. ↑ Kim et al. "Dietary factors and stomach cancer: a case-control study in Korea." International Journal of Epidemiology 24 (1995): 33-41. ↑ TDC International Market News (Mar 14, 2002) "High-tech kimchi refrigerators keep Korea's favourite food crisp." Retrieved November 30, 2007. ↑ James Card WIRED "Korea Casts an Eye Heavenward." (Aug. 21, 2006). Retrieved November 30, 2007. ↑ . AsiaInfoKorea. "Food in Korea - The Humor in Kimchi" Retrieved November 30, 2007. This page was last modified on 18 June 2014, at 15:00.